Wow what an amazing morning I have had. Today I was booked into the Look Good Feel better program - I had been recommended to go by the breast care nurse at the local hospital. It is a morning run in the cancer centre in the area and basically is available for ladies having treatment for cancer including chemotherapy! As I am due to start next week i thought it might be a good idea to get some tips before my hair and skin start reacting to chemo. The session basically looks at good skin care, make-up regime, how to tie head scarves , how to care for wigs etc. There were about 15 ladies there - in various stages of treatment - I think that I was the newest one to the breast cancer journey there. To help us try everything there were some friendly helpers! The session was run by a qualified beauty therapist who gives her time once a month to run the sessions - as it turned out this was a very familiar face to me - one of the mums from school!! We each had a spot with a mirror and all manner of skin care and make up bits and pieces!! I must add that they weren't just samples but full sized bottles etc all kindly donated from the brandnames. Yes they had brandnames - amongst those Clarins, Revlon, Avon, Lancome etc every lady had a selection with some of these in their range and we were able to take them all home. What an amazing treat - we had to fill in a questionaire before attending and the selection was chosen in accordance with our answers. Amongst my amazing selection was a Chanel foundation - something I would never have bought and will now be using very sparingly hehe !!!! I had been a bit apprehensive about going - unsure about how I would feel facing my illness again. Well I have to say I found the morning very encouraging and was so inspired by the women I met there. I sat next to a lovely lady that I just hit it off with and as is it turns out lives about 5mins from me!! 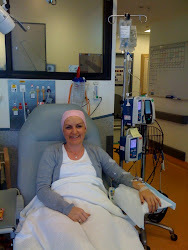 She has just finished her chemo and is starting on the next set of treatments!! We exchanged numbers and are planning to meet up! There were women going through chemo who had managed to work in between and it was great to see women ahead of me in the journey!! I have an appointment to get my hair cut this week - I am going really short - and I have to say I am feeling more ready after today!! I have a few more medical appointment s to get through and then it will be d- day. This week Granny and Grandpa are away and I have used the time to get my house in order! I did a similar exercise before the mastectomy and now am thankful I have this week to put things in place for the next chapter! Psychologically it just feels feels better to have things sorted now - even though I know it won't take long for it all to unravel again!! So I shall go to bed tonight dreaming of makeovers and new hairdos or lack there of hehe - perhaps I shall grasp the bald head with 2 hands and change my look forever! !